For the toffee caramel, bring a pot of water to a boil. Place a closed can of sweetened condensed milk into the pot and let simmer on the side for approx. 2 hrs. at medium heat. Then, remove from the pot and allow to cool in the fridge. In the meantime, add butter, sugar, and salt to a stand mixer and beat until foamy. Halve vanilla bean and scrape out seeds. Add vanilla bean seeds, zest lemon and add to the stand mixer, together with egg yolks. Beat again. Add flour and baking powder and beat until smooth, then allow to cool in the fridge for approx. 1 hr. Prepare a sheet of parchment paper and place dough and another sheet of parchment paper on top. Using a rolling pin, thinly roll out dough and allow to cool in the fridge for approx. 15 min. Coat the bottom of a tart pan with warm butter and flour the edge of the tart pan. Remove dough from the fridge, place bottom of tart pan on top and cut along the edge. Remove the upper sheet of parchment paper and transfer dough into the tart pan. Preheat the oven to 160°C/320°F. Press remaining dough onto the edge of the tart pan. Lightly flour and cut off excess dough around the edge. Pierce dough all over with a fork and place parchment paper on top. Add pie weights to the tart pan, transfer to the oven and bake for approx. 15 min. Remove pie weights and bake for approx. 10 – 15 min. more. Meanwhile, chop half of the hazelnuts and set aside. Add sugar and water to a pot and let caramelize. Stir in baking powder and remaining whole hazelnuts, then transfer to a baking sheet and allow to cool. For the orange filling, grate oranges and set zests aside. Crush lemongrass stalk, chop, and transfer to a small saucepan. Grind cardamom pod, coriander seeds, clove, and star anise in a mortar and transfer to the saucepan. Juice oranges, add juice to saucepan and bring to a simmer. Let reduce, then strain through a sieve and transfer back to the saucepan. Soak gelatin sheets in water. Add corn syrup and sugar to the saucepan with orange-spice mixture and bring to a boil. Roughly chop white chocolate and set aside in a bowl. Squeeze gelatin sheets and add to the saucepan. Stir until dissolved, then pour over chopped, white chocolate. Mix with immersion blender, add remaining sweetened condensed milk that hasn't been caramelized in the first step and mix again. Transfer to the fridge and let cool completely. 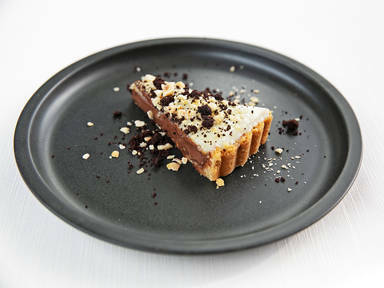 Spread toffee caramel from the can onto cooled tart crust and distribute chopped hazelnuts on it. Allow tart to cool in the fridge again. For the ganache, chop dark chocolate and transfer to a measuring cup. Dice butter. Heat heavy cream in a saucepan, add the orange zest and remaining sugar, and bring to a boil. Pour hot cream over the chopped, dark chocolate and mix carefully. Add créme fraîche and butter and mix again. Strain through a sieve. Remove cooled tart from the fridge and distribute the ganache on it. Allow to cool for approx. 4 hrs. Chop the caramelized hazelnuts and set aside. Remove tart from the fridge spread orange filling onto the tart. Sprinkle with chopped, caramelized hazelnuts. Garnish with flaky sea salt and cookie crumble. Enjoy!